Eating snake hearts. Sounds fun. But, Dana is enchanted by this idea. I can think of better ways to spend my evening and 18 USD than watching someone inhumanely kill snakes (one of my favorite animals). Of course, in the end, I’m out numbered and we decide to go. Looking back, I wouldn’t change this decision for the world. Our hostel van rocks up in front of a deserted and somewhat underwater outdoor restaurant (you can thank the recent typhoon) where we are greeting by what looks like three generations of this family. My reservations are growing by the minute. First they show us the snake cages and let us hold them if we like. I’m trying not to picture them as my next meal. We’re given a quick explanation on the do’s and don’t’s of snake-heart-ripping-out. It’s a method they seem to have down to an art. DO: Wait 5 seconds before swallowing. DO: Breathe. DON’T: Chew the heart (I’ll explain why in a moment). DON’T: Hesitate. The first guy is up. Our snake wrangler squeezes the snake to locate the heart and makes a swift incision while simultaneously popping out the heart (mind you, it’s still functioning and attached to the snake). The first brave snake-eater kneels down and viciously rips the heart out. I notice that they are careful to catch the blood and bile in cups below. No wasting here. The first guy was a big spectacle, with everyone shooting pictures and making noises of excitement. I also notice at this point that Becky, Dana, and I are the only girls present. The reason becomes apparent as after the first heart is eaten, both girls begin taking steps back. For some reason, a gripping sense of curiosity overcomes me and I end up watching all 8 hearts get pulled from the live, writhing snakes with intensity. Clearly, I’m a bit twisted. I know what you are wondering. No, I didn’t eat one myself. One gentleman ended up chewing the heart (as promised, an explanation). Within about one minute he passes out. In the confusion and upset, the reason behind the “no chewing” rule is explained. Turns out, the heart contains a poison that can be broken down in our stomaches, but not by the saliva in our mouths. So, if you chew it, it goes straight to your brain, causing you to pass out momentarily. No worries, he comes around in a matter of seconds, wondering how he ended up on the floor. The night has only just begun. After the heart-eating event, we sit down and are served two shots: a bile green shot and a blood red shot. I’m not even kidding. I took both without reservations, but I will say that the blood shot burned unlike any alcohol I’ve ever had before. Then, we all take shots of rice wine and the snake feast begins. We are instructed to take a shot before each course. Which, ends up being a problem as there are 7 courses. The ones I can remember are: a rice pilaf with snake bits, snake spring rolls, snake meat balls (I later find out these were snake testicles), and snake ribs (definitely my least favorite, as the bones were too small). Mind you, we ate lots of other interesting, snake meat infused dishes, but after my 5th shot, things began to blur. We eat, drink, and make merry for about two hours. 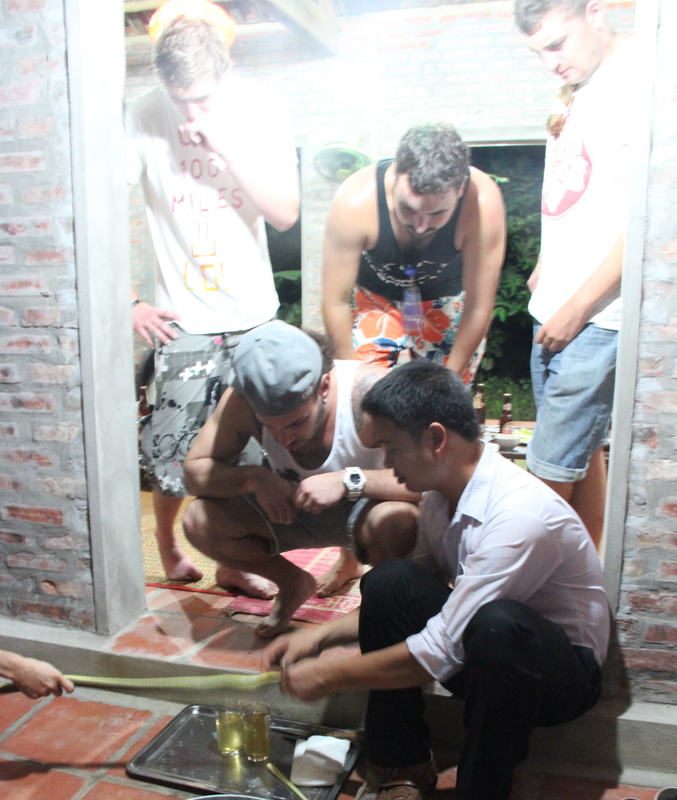 After our delicious and incredibly filling snake meal, we drag our drunken party of 16 back to the hostel. Not before, of course, accidentally letting out a few snakes in an attempt to get snake skin from within the cages and angering the snake village. Obviously, I wasn’t involved at all. For anyone with a stomach that can handle it, I highly recommend this. Despite feeling really terrible for the snakes, I enjoyed the experience immensely. I do take comfort in the fact that every last bit of snake is put to use. That said, if you ever get the chance to do this in Vietnam, absolutely, no questions asked, do it. This entry was posted in Blog and tagged adventure, backpackers, backpackers heart, backpackers vietnam, bed, budget tour, cheap, cheap hotel, cheap tour sapa, cheapeast hostel hanoi, dorm, drink, drinking blood in Vietnam, eating, experience, food, friendly, halong, hanoi, hanoi youth hostel, heart snake, holiday, hostel, hostel hanoi, noodles, odd, price, private room, sapa, snake, strange food, tour, travel, vietnam, vietnam guide, vietnam snake, village, weird, youth.